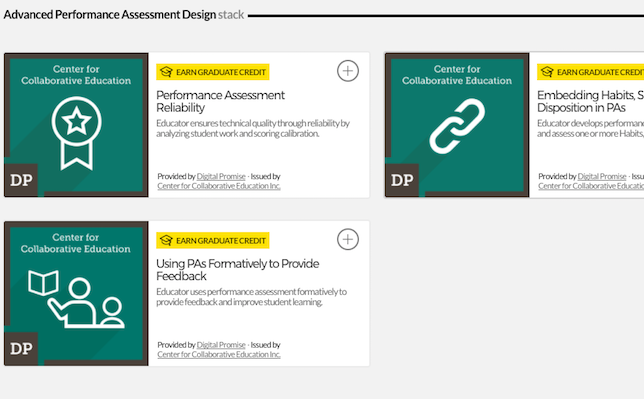 Online professional development platform BloomBoard has partnered with four accredited universities to enable teachers who complete micro-credentials to earn graduate-level credit. The company has teamed up with Brandman University, Fresno Pacific University, Portland State University, and the University of the Pacific. Although graduate-level professional development credit offered by each institution is non-degree bearing, it will be available for select micro-credentials on the Bloomboard platform, according to a company statement. Out the gate, BloomBoard has added graduate credit to more than 200 micro-credentials. BloomBoard launched its micro-credential program in 2015 with Digital Promise, a nonprofit dedicated to advancing innovation in education. Educator micro-credentials have been rising steadily, since they provide educators with the opportunity to gain recognition (i.e. pay bumps and promotions) for skills they develop throughout their careers. Educators who have already earned a micro-credential and want to receive graduate credit can visit the program site. School and districts interested in learning more about the graduate credit offering can visit the BloomBoard site.